Turn That Frown Upside Down: Is There A Good Reason We're Depressed? Writing in the journal Psychological Review, postdoctoral fellow Paul Andrews of Virginia Commonwealth University and psychiatrist J. Anderson Thomson Jr. of the University of Virginia present research suggesting that depression is present in the species, and in individuals, for a purpose, and we're playing with fire if we try to eradicate it. In evolution-speak, depression is an "adaptation," they argue. That is, it evolved because it made individuals who experienced it fitter, under natural selection, than individuals who did not experience it. Andrews and Thomson-who is best known for research on the psychology of religious belief, and who has also studied whether antidepressants threaten love and fidelity-offer as evidence the presence of a molecule in the brain called the 5HT1A receptor. This serves as a docking port for the neurochemical serotonin, which the Prozac/Zoloft/Paxil class of antidepressants targets. Human brains are not the only ones with the 5HT1A receptor. Rats also have it. And said receptor's important to recognizing and dealing with stress and threat, rather than leaving us (and rats) in a perpetual state of unwary bliss. "In other words, losing the receptor that promotes depression in response to stress is something evolution thought would be a very bad move. Ergo: depression is not something to be thrown out lightly." Indeed, it's suggested that depression can lead to analysis and solutions, focused thinking, and even "negative" depressive traits - such as self-isolation or loss of libido, ie the reason we take Paxil - that may serve an adaptive function. There are some really interesting points in here: are we overmedicated? Probably - and a little sadness, as the author says, should not be the bogeyman it's become in our times. But clinical depression - either human or rat - is a dicier issue altogether. As these researchers would surely be the very first to point out, even if depression can be proven to have en evolutionary purpose, as we all know, what's good for us as humans isn't necessarily good for us as people. 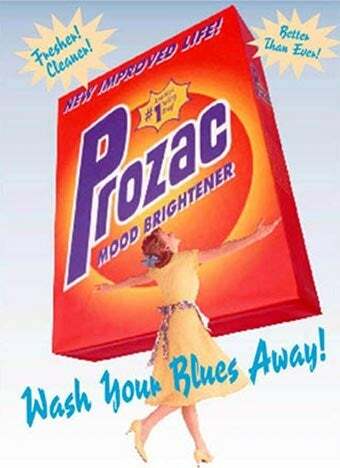 Then too, it seems pretty logical that plenty of modern stimuli - to say nothing of pharmaceuticals, diet, chemicals, environment - could have a hand in that depression that Mother Nature had absolutely nothing to do with. Then there's the other elephant in the room: depression can lead to suicide - which, in the small scheme, isn't helping anyone's progress. It's both fascinating and reassuring to know that there may be an evolutionary rationale for what can feel like an unfair genetic curse, and with any luck, if true, this will be of substantial use to researchers. But as it stands, I'm not canceling that Lexapro prescription any time soon.